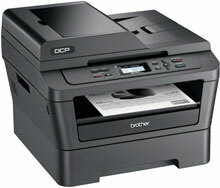 Laser Multi-Function Copier with Duplex Printing and Networking. The Brother DCP-7065DN is an affordable multi-function copier that is great for making quick copies or printing text-based documents. It features automatic duplex printing for producing two-sided output, and a built-in Ethernet interface for sharing with others on your network. Its 35-page capacity auto document feeder allows for unattended, multi-page copying or color scanning. Plus, its advanced capabilities allow you to scan documents to a file, image, E-mail or OCR. To help lower your operating costs, a high-yield replacement toner cartridge is available.